Design/construction professionals hope their project designs proceed without missteps or complications. Of course, that rarely happens. The lighting product specification and bidding process is complex, as it involves many interested parties, each with its own stake in which products are ultimately installed in the project. In the construction industry, falls are a major cause of workplace-related deaths, responsible for over a third of construction worker fatalities. Of fatal falls occurring between 1992 and 2009, one third total were from roofs. Architecture firm Tria designs a collaborative, open-office environment for Boston-based real estate firm Cresa. The new office of Boston-based real estate firm Cresa has opened in the city’s Waterfront District. Tria provided interior architecture and corporate design services, creating an open, modern, and collaborative workspace that maximizes natural light and views of the Boston Harbor. The office is located on the 10th floor of a Leadership in Energy and Environmental Design (LEED) Platinum-certified mixed-use tower. Tria has incorporated a variety of work settings and gathering spaces to create a casual and collaborative office. The existing space features an open perimeter, high ceilings, and expansive glass, that helped accentuate daylight and views of the water. 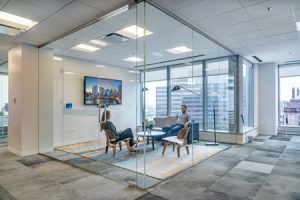 Glass-fronted offices and clusters of low-walled workstations provide transparency and connection, and technology-enabled collaboration spaces, such as large conference rooms, small huddle areas with standing-height tables, and casual meeting rooms with soft seating, provide choices for interaction. Shared locker storage areas offer visual separation of work zones and double as stand-up meeting spaces for impromptu gatherings. In designing the space, the architects blended a warm neutral palette with wood tones to create a modern style. A range of polished and rustic materials enhance the space, including concrete flooring, exposed wood ceilings, reclaimed wood details, and glass walls. A wood slat ceiling extends from Cresa’s reception area into the main tenant corridor to create a distinct feel as visitors enter the office. A demountable wall between the reception area and adjoining conference room features a fully integrated, seamless technology system, with one flat panel screens.